Bonhams announced two dozen pioneer, veteran and Brass Era automobiles from the Don C. Boulton Collection for the Amelia Island 2019 sale. Bonhams announced the sale of the Don C. Boulton Collection of two dozen Pioneer, Veteran and Brass Era automobiles and automobilia at the Amelia Island Auction on March 7th, 2019. The marques represented in the Boulton Collection include: Austin, Columbus, Haynes, Knox, Locomobile, Matheson, Mercer, Oldsmobile, Packard, Peerless, Pierce-Arrow, Pope, Rambler, Simplex, Tincher and Welch. Seven of these cars could be eligible for the annual London-to-Brighton Emancipation Run. As with most cars of this age, those in the Boulton Collection have wonderful stories to tell. 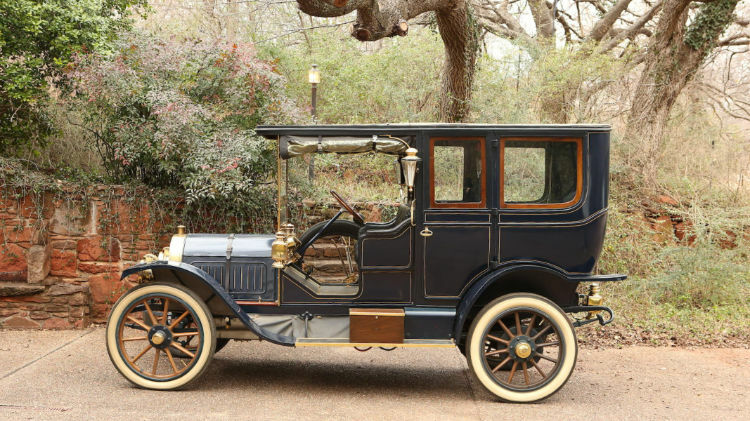 One, for example, is the 1910 Pope Hartford Model T Limousine that was originally owned by Uruguay’s ambassador to the Vatican and in which Pope Pius X was reported to have ridden. The marques represented in the Boulton Collection headed to Amelia Island include: Austin, Columbus, Haynes, Knox, Locomobile, Matheson, Mercer, Oldsmobile, Packard, Peerless, Pierce-Arrow, Pope, Rambler, Simplex, Tincher and Welch.